"Remember that in ordering your studies you make them as pleasant as may be, and as fruitful as possibly you are able, that so you may not be weary in the work that God sets you about..."
This past February I applied for 2 summer teaching institutes. 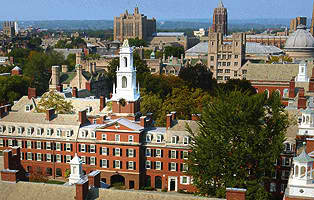 My first choice was a one week seminar on Early Colonial America at Yale University in New Haven Connecticut. My second choice doesn't matter because I was accepted to my first choice!! I will be honest in saying that in high school I would not have had the credentials to come close to going to an Ivy League school. Not that I didn't have good grades but they were not up to par for an Ivy League school nor did my parents have that kinda of money to send me to any Ivy League school. The history of Yale itself, founded in 1701,is just fascinating and just to experience the campus and atmosphere is so rewarding as an educator. The Old Campus architecture is just beautiful! .......this is the Cross Campus area above. Straight ahead is Sterling Library. ........he said his family tree dates way back to the 1700's and there are many graduates from Yale in his family. He got into Yale cuz his Dad and great, great grandpas were alumni......though he said some of them were known to be a little nuts. He also said he is majoring in environmental studies, particularly recycling.